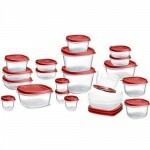 Rubbermaid 24 Piece Food Storage Set with Easy Find Lids only $10! You are here: Home / online shopping / Rubbermaid 24 Piece Food Storage Set with Easy Find Lids only $10! The price on this Rubbermaid 24 Piece Food Storage Set with Easy Find Lids has dropped to just $10! I have this set and I love it! 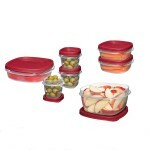 The whole container set can be used for efficient and compact food storage. As this food storage set features containers of different sizes, you can easily store varied quantities of different foods. It features easy-find lids that conveniently snap to the base bottom and to each other. The lids seal tightly preventing leakage or spill of food kept inside. 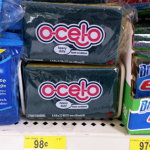 The clear base allows you to conveniently see the contents without having to open the lids. The simple design lets you stack the containers one above the other for easy storage. These truly functional Rubbermaid food storage containers are safe for microwave, freezer, refrigerator, and dishwasher use. Solve all your food storage problems with this Rubbermaid food storage set. 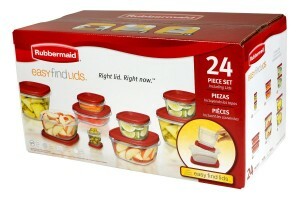 Rubbermaid Easy Find Lids 24-Piece Food Storage Set only $9! 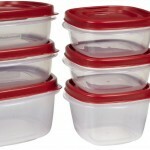 Rubbermaid 18 piece Easy Find Lid Food Storage Set only $9.99! 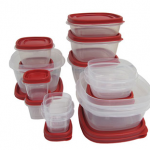 Rubbermaid 42-Piece Easy Find Lid Food Storage Set only $14.99! Rubbermaid 42 Piece Easy Find Lid Set only $15.99!